The Commonwealth War Graves Commission (CWGC) commemorates the 1.7 million men and women of the Commonwealth forces who died in the two world wars. Their cemeteries, burial plots and memorials are a lasting tribute to those who died in some 154 countries across the world. The CWGC register records details of the Commonwealth war dead so that graves or names on memorials can be located. In the UK no fewer than 300,000 war dead are commemorated, some as names listed on large memorials, but more than 170,000 have known and marked graves in 12,500 locations around the UK. 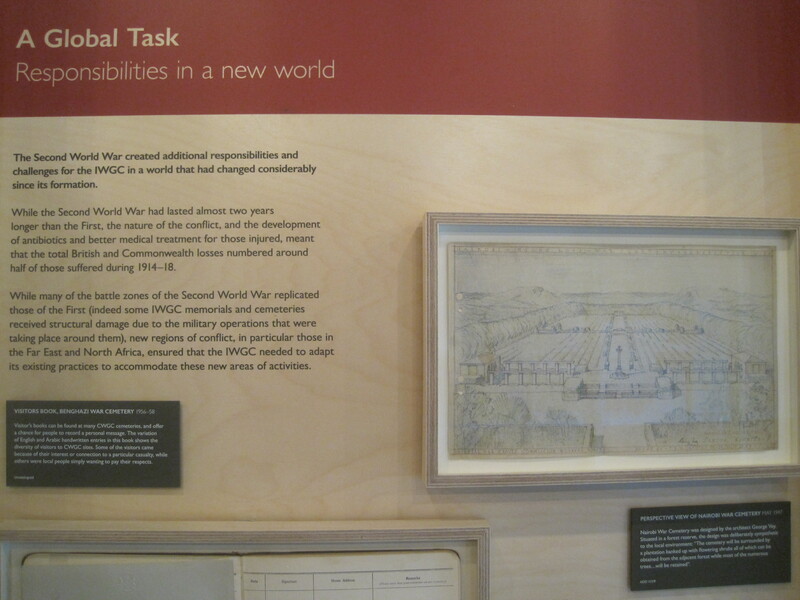 A small but fascinating and moving exhibition marking the centenary of the CWGC is currently being held at Brookwood Military Cemetery in Surrey, the largest CWGC site in the UK with more than 5,000 burials and 3,500 commemorations. The military cemetery is located within the larger civilian Brookwood Cemetery between Woking and Farnborough. You can drive there but it’s also directly accessible from Brookwood train station on the Waterloo to Basingstoke line. You simply go down some steps from the platform and through a gate into the huge public cemetery. 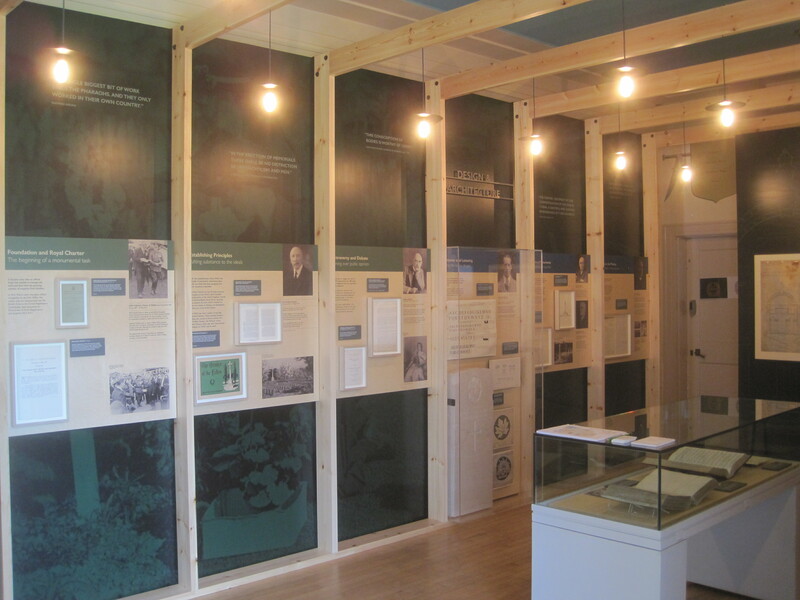 The exhibition is being staged in the Canadian Records Building at the western part of the cemetery, nearest the entrance from the main road. 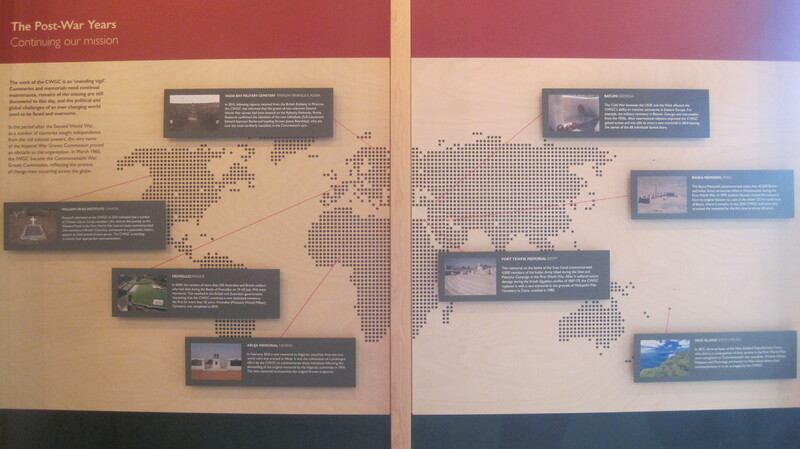 It is small, contained in just one room, and consists of twelve factual panels looking at different aspects of the history, plus a video, architectural designs, a display case of books and documents, and a map of the world highlighting just how global the Commission’s work is. Sir Fabian Ware volunteered to fight in the Great War but being in his 40s, was considered too old to fight so he served in the Ambulance Corps on the Western Front. He was dismayed to see so many corpses and body parts being buried randomly without any organisation. It seemed to him that each body deserved respect, and that family members back home would desperately want to know the fate and location of their loved ones. He made suggestions to his superiors. By 1915 his mobile unit was officially recognised and incorporated into the British Army as the Graves Registration Commission. After several further evolutions the Imperial War Graves Commission was given a Royal Charter on 21 May 1917. 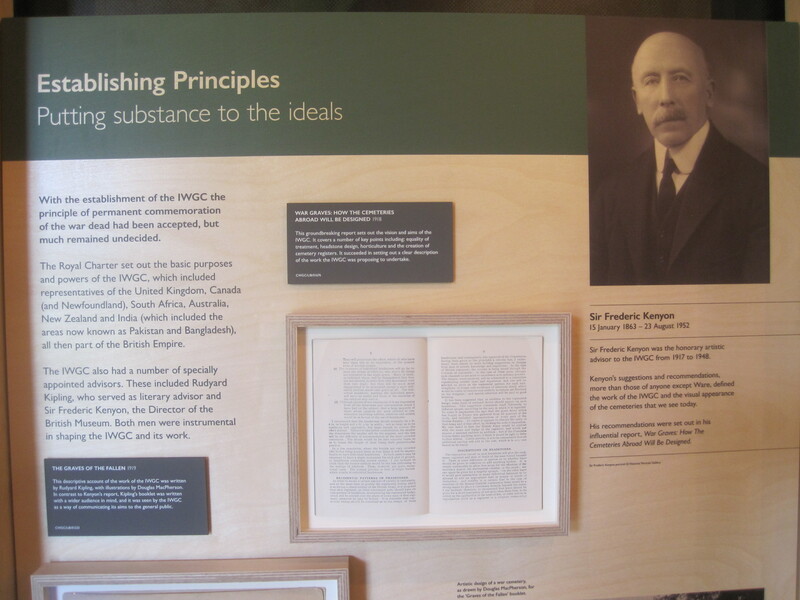 The IWGC contacted Sir Frederic Kenyon, Director of the British Museum, for his advice, and it was Kenyon’s advice and suggestions which shaped the appearance and design of the graves, memorials and cemeteries. All this was contained in his far-reaching report War Graves: How the cemeteries abroad will be designed. Rudyard Kipling, who had lost his son in 1916, was asked to be literary advisor and served in that capacity right up till his death in 1936. 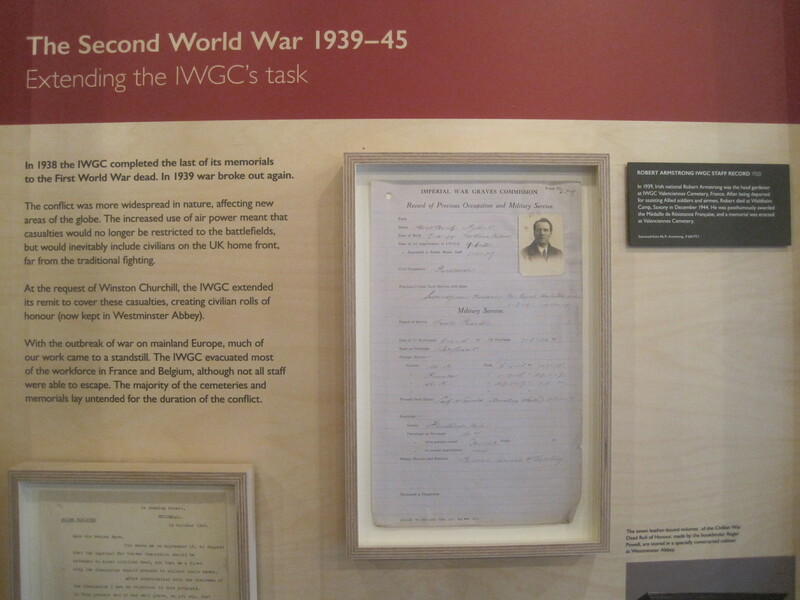 It was Kipling who suggested many of the phrases used by the IWGC such as ‘Their name liveth for evermore’, ‘Known unto God’ and ‘Their Glory shall not be blotted out’. 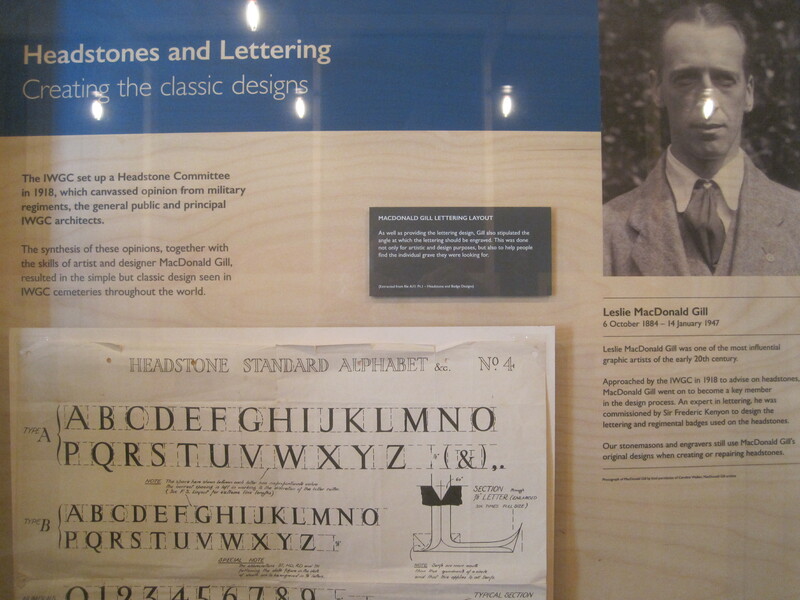 One of the foremost designers of the early part of the 20th century, Leslie MacDonald Gill, was commissioned by Kenyon to design the lettering and regimental badges on the headstones. His concern for detail included stipulating the angle at which the lettering should be engraved, to make the names easier to read. 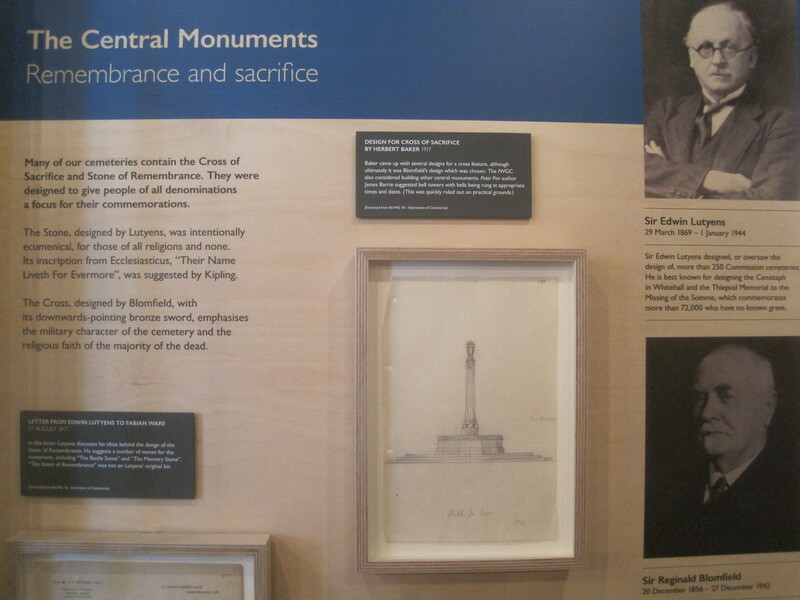 Sir Edwin Lutyens oversaw the design of more than 250 IWGC cemeteries, but is best known for designing the Cenotaph in central London and the Thiepval Memorial to the missing of the Somme. Sir Reginald Blomfield designed the Cross of Sacrifice which stands in numerous IWGC cemeteries round the world. More than 500,000 service men and women who died during the First World War have no known grave. 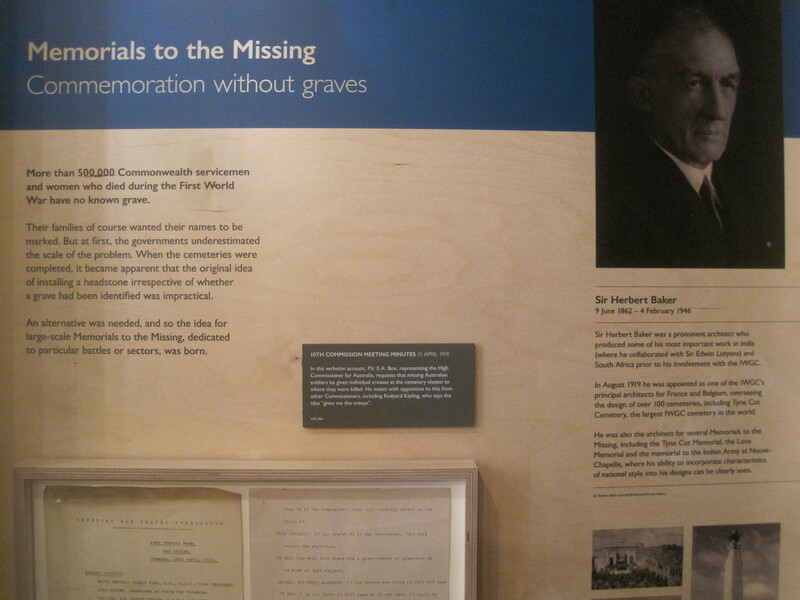 The exhibition shows how the idea of memorials for the missing was born and developed. It features the work of Sir Herbert Baker, who designed a number of memorials to the missing in France. Sir Arthur Hill was Director of the Royal Botanic Gardens Kew and was asked to be the commission’s horticultural advisor. He recommended the types of flowers, shrubs and trees which would best suit the IWGC’s numerous locations. Once the principles of design and layout were established, they could be extended beyond core European battlefields in France and Belgium to more far-flung locations, such as Greece, Turkey, Iraq and Egypt. A leading role was played by Sir John James Burnet who was tasked with designing cemeteries and memorials appropriate to the local conditions. The IWGC had just about completed its enormous task in 1938 when, with horrible irony, another world war broke out the following year. Due to intensive bombing many more civilians died than in previous conflicts and the IWGC expanded its remit to cover these casualties. The Commission’s staff had to be evacuated from the continental cemeteries many of which were now, once again, in war zones. 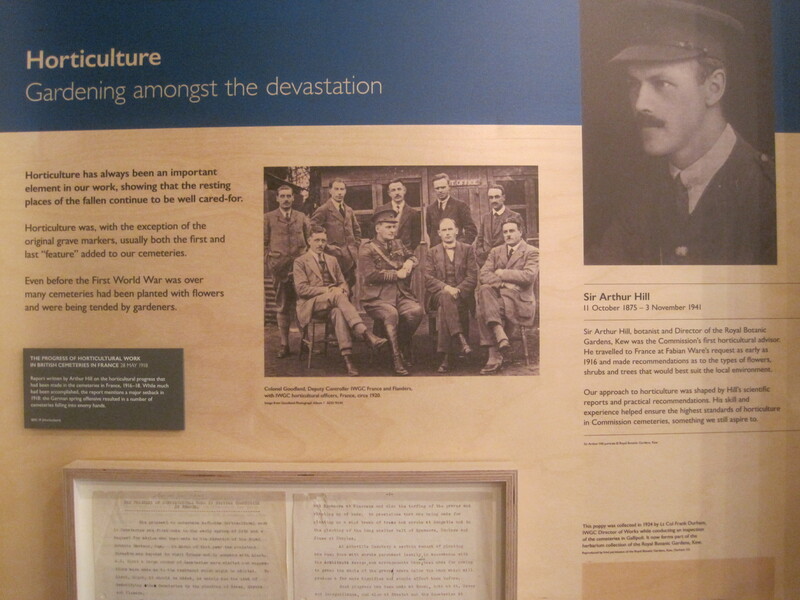 British and Commonwealth casualties in the second war were about half of those in the first, largely because of the nature of the war (i.e there wasn’t the grinding butchery of four years in the trenches) and because the advent of early antibiotics meant fewer soldiers died of infection from wounds. 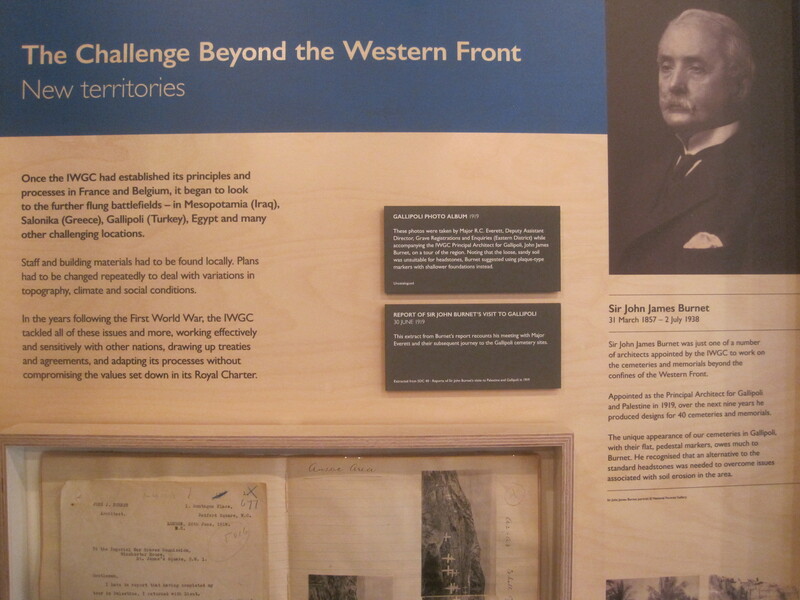 But the IWGC’s work started anew after 1945, and now had to be extended to new theatres of war, in North Africa and the Far East. As Britain divested itself of its empire the Imperial War Graves Commission changed its name to the Commonwealth War Graves Commission in March 1960. Its work continues to this day, not only maintaining existing cemeteries, and running an enormous database of wartime casualties (which can be searched online) but supervising the burial of the dead in conflicts which continue to the present day. This map shows just a handful of the hundreds of cemeteries worldwide which are managed by the CWGC. 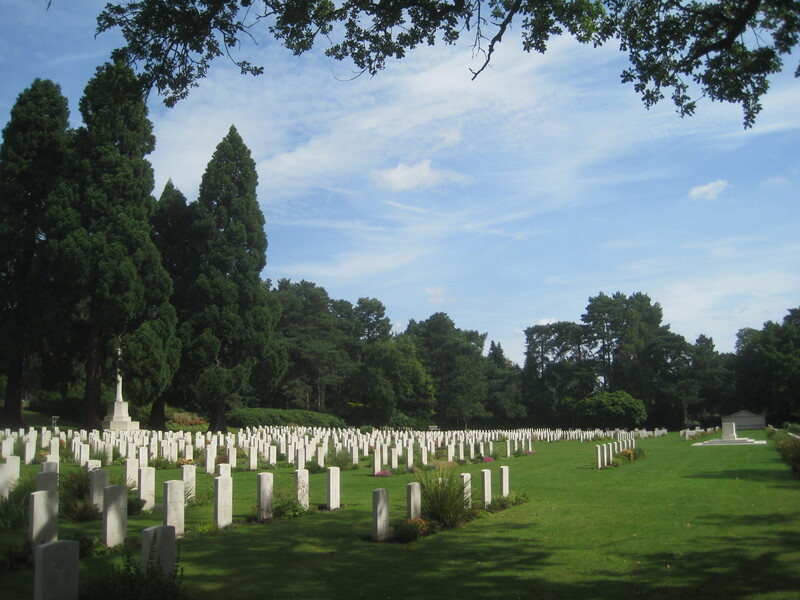 The Brookwood Military Cemetery – and the wider rambling old Victorian public cemetery of which it is only a part – are both well worth a visit. 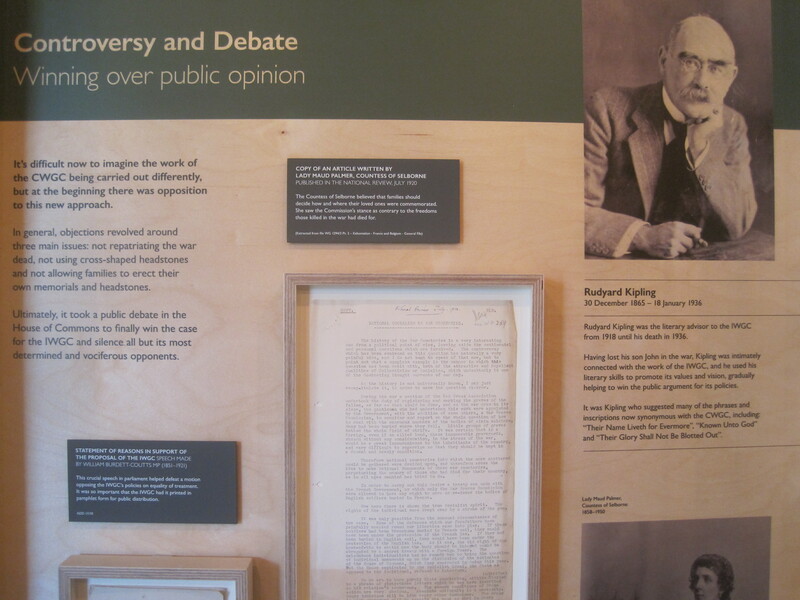 And if you’ve ever thought of going, make a point of going now while this small but fascinating exhibition is open.